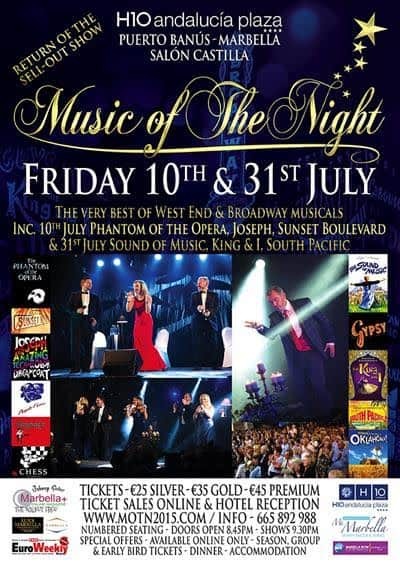 We are delighted to announce the return of the hit sell-out show ´Music of the Night´ to the H10 Andalucía Plaza Hotel, Puerto Banus, Marbella, for an exclusive season of 5 different performances this spring and summer! TICKETS ON SALE NOW. Please find information on our new website www.motn2015.com, where you can also select your seats and purchase tickets. You can also book direct via our new online box office or simply click “Buy Tickets” at the top of our Facebook page. Various advance purchase and other special offers available online. ´Music of the Night´ is produced by Tenor Stephen Lloyd-Morgan, who stars alongside the amazing international cast of Tenor Raúl D’Abreu, Soprano Julie-Anne Hunter, Adele Lee Peters and Lucy Indrisie. Some performances may include special guests. As well as this exclusive season in Marbella, ´Music of the Night´ will also perform in other parts of Spain and Europe this year. Please see www.motn2015.com for photo gallery, previews & reviews of previous performances.